Make a profit off of every last inch of winter. Built from ultra-high molecular weight polyethylene, the new SnowEx heavy-duty pusher snow shovels have been commercially tested for performance and durability. 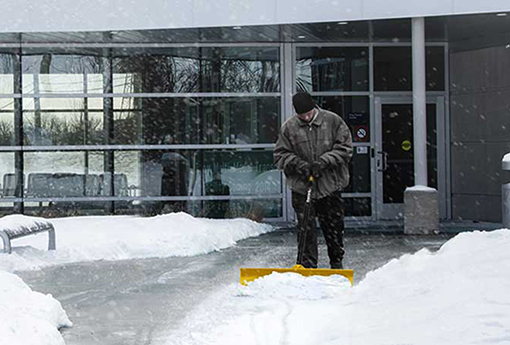 Available in 30" and 36" pusher shovel blade widths and as a wheeled pusher shovel with a 36" blade width, SnowEx shovels are lightweight and built to maximize efficiency—no matter where you need them in St. Peters. Built to reduce fatigue and eliminate heavy lifting, the heavy-duty wheeled pusher shovel features a powder coated steel u-shape handle and a bi-directional 36" blade, improving your ability to push through winter. Thanks to its angled blade with windrowing action, the wheeled pusher shovel moves snow 50% faster than traditional snow shovels with minimal effort. Constructed from durable, ultra-high molecular weight polyethylene and fiberglass, SnowEx pusher shovels are reinforced at the bracket and handle to ensure unstoppable performance. The nylon D-handle improves operator grip when shoveling sidewalks, entryways and driveways. Constructed from ultra-high molecular weight polyethylene for superior strength, wear resistance and snow turnover. A heavy-duty support bracket and handle are reinforced at the point of attachment to withstand even the harshest winter conditions. With the flip of the blade, the wheeled shovel features bi-directional blade movement for increased versatility on each pass. No tools required! 6" wheels constructed of durable plastic and rubber allow for easier pushing and increased stability in winter conditions. Blade Dimensions 30" x 9.25" 36" x 9.25" 36" x 10.5"
Overall Shovel Dimensions 30" x 54" 36" x 54" 36" x 48" x 18"